By a large margin, the highest black student graduation rate at a historically black college belongs to Spelman College, the academically selective, all-women’s school in the city of Atlanta. In fact, Spelman’s black student graduation rate of 78 percent is higher than the black student graduation rate at 12 of the nation’s 57 high-ranking predominantly white colleges and universities examined in the current JBHE survey. Spelman’s unusual strength shows in the fact that it has a higher black student graduation rate than such prestigious and primarily white colleges as Colby, Berkeley, UCLA, Michigan, Bowdoin, Chapel Hill, and Carnegie Mellon. Following Spelman in the rankings, the next-highest black student graduation rate among the HBCUs was at Howard University. At Howard, 62 percent of the entering black students go on to graduate within six years. Claflin University in South Carolina has a black student graduation rate of 60 percent. Hampton University, Morehouse College, and Elizabeth City State University, sadly, are the only other HBCUs that graduate at least half of their black students within six years. New York Governor David Paterson has proposed an extensive new student loan program for low-income college students in the state. The program would disproportionately apply to black and Hispanic students. Paterson made the proposal despite the fact that the state is facing a $15 billion budget shortfall. And the decision came on the heels of the first tuition increase in four years at the State University of New York and City University of New York campuses. Under the new program, students from low-income families who are enrolled at two-year colleges would be eligible for up to $20,000 in loans from the state with interest rates lower than they could receive from private lenders. Students at four-year institutions would be eligible for up to $50,000 in loans. The state estimates that New York’s one million college students currently are holding $2 billion in private loans at interest rates that average around 12 percent. The Rutgers University Center for Race and Ethnicity, Institute for Research on Women, and Department of History announce a multi-disciplinary conference on African American Women in the Academy. Admission is free and open to the public. For information and registration go to www.blackwomenintheivorytower.com. Any e-mail inquiries can be sent to ivorytower2009@gmail.com. Go to the conference website to see a full list of the speakers. According to the latest Department of Education data, blacks are only 3 percent of the 7,500 undergraduate students at the University of Dayton, a Catholic educational institution in Ohio. In an effort to boost racial diversity, the university has established the Dayton Early College Academy, a charter high school that serves low-income minority students in the city of Dayton’s public school system. It is the only charter high school in the nation operated by a Catholic university. The high school was founded in 2003. Students take a challenging curriculum which includes at least nine hours of college-level courses while in high school. To date the Dayton Early College Academy has graduated 80 students, all of whom have gone on to college. The charter high school serves as a valuable feeder institution to the University of Dayton. Thirty students from the first two graduating classes in 2007 and 2008 have enrolled at the University of Dayton. Twenty-two of these 30 students are African Americans. Thus the charter high school has become an important tool in efforts to increase racial diversity at the University of Dayton. Representative Bill Owens is a white Democrat in the North Carolina House of Representatives who represents a district that includes the campus of historically black Elizabeth City State University. Owens has proposed that the university change its name to reflect the fact that it is part of the University of North Carolina system. Owens believes that a name change would help the university attract more faculty and students, raise money, and garner research grants. Thirteen years ago Owens cosponsored a bill that changed the name of Pembroke State University to the University of North Carolina at Pembroke. Since that time enrollments at the university have more than doubled. The Center for Black Literature at Medgar Evers College of the City University of New York has announced that it will hold the tenth annual Black Writers Conference this March. Toni Morrison, professor emerita at Princeton University and Nobel laureate in literature, will be the honorary chair of the conference. 58% Percentage of white Americans with incomes of more than $50,000 who had an individual retirement account (IRA) in 2008. 37% Percentage of black Americans with incomes of more than $50,000 who had an individual retirement account (IRA) in 2008. Ella Mae Johnson was born in 1903. This week she celebrated her 105th birthday. But next Tuesday, as a guest of Ohio Senator Sherrod Brown, she plans to attend the inauguration of Barack Obama as the first African-American president of the United States. Johnson graduated from Fisk University in 1925. Three years later she earned a master’s degree from the School of Applied Social Sciences at Case Western Reserve University in Cleveland. Morris Brown College Is Back in Business: But for How Long? Earlier this month JBHE reported that Morris Brown College, the historically black educational institution in Atlanta that was founded in 1881 by former slaves, might not open for the spring semester. The college, which is not accredited, is in dire financial condition with $30 million in debts. In December the city of Atlanta turned off the water supply to the college because of more than $300,000 in unpaid bills. More than $150,000 was raised over the holiday period to make a down payment on the water bill. The city accepted the payment and turned the water back on. However, the city is demanding another payment of $214,000 by February 17 or it will once again cut off the supply of water to the college. • Kevin Young, Atticus Haygood Professor of English and Creative Writing at Emory University, was named curator of literary collections for the university’s Manuscript, Archives, and Rare Book Library. Professor Young, the author of six poetry collections, is a graduate of Harvard University and holds a master of fine arts degree from Brown University. • Gloria J. Gibson was appointed executive vice president and provost at the University of Northern Iowa. Dr. Gibson was dean of the College of Humanities and social sciences and professor of English, folklore, and musicology at Arkansas State University. Dr. Gibson holds bachelor’s and master’s degrees from Southern Illinois University. She earned a Ph.D. in folklore and musicology from Indiana University. • Kwesi E. Aggrey was named provost and vice chancellor for academic affairs at North Carolina Central University in Durham. He was vice chancellor for academic affairs at Indiana University-Northwest in Gary. Dr. Aggrey is a graduate of Kwame Nkrumah University of Science and Technology in Ghana. He holds a Ph.D. in analytical chemistry from the University of Hawaii. • Marilyn Sanders Mobley was appointed vice president for inclusion, diversity, and equal opportunity at Case Western Reserve University in Cleveland. For the past year she has been serving as provost at Bennett College for Women in Greensboro, North Carolina. Previously, she was associate provost for educational programs and associate professor of English and African-American studies at George Mason University. Dr. Mobley is a graduate of Barnard College. She holds a master’s degree from New York University and a Ph.D. in English from Case Western Reserve University. • Monique Holland was promoted to director of athletics at Alabama State University in Montgomery. Since June she has served as the associate athletics director. Previously she was an associate athletics director at Georgia State University. • Kenda Mutongi, professor of history and chair of the Africana studies program at Williams College in Massachusetts, was honored by the African Studies Association for her book Worries of the Heart: Widows, Family, and Community in Kenya. Dr. Mutongi is a graduate of Coe College in Cedar Rapids, Iowa. She holds a master’s degree and a Ph.D. in history from the University of Virginia. • Marlon Lynch, assistant vice chancellor and chief of police at Vanderbilt University, was named one of the 25 most influential people in the security industry by Security Magazine. Lynch is a graduate of Michigan State University. He holds a master’s degree in criminal justice from Boston University. • Marjorie Brittain Hammock, assistant professor and field coordinator in the social work department at Benedict College in Columbia, South Carolina, was named the 2008 Social Work Pioneer at the National Association of Social Workers. A recent report from the California Postsecondary Education Commission finds that African-American and Latino students continue to lag whites and Asians in qualifying for places at the University of California and the California State University systems. The report states that 24 percent of black high school graduates in California qualified for admission to the California State University system. For whites, 37.1 percent of all high school graduates qualified for admission to campuses of California State University. For the University of California campuses, only 6.3 percent of black high school graduates in California met the minimum admission requirements. 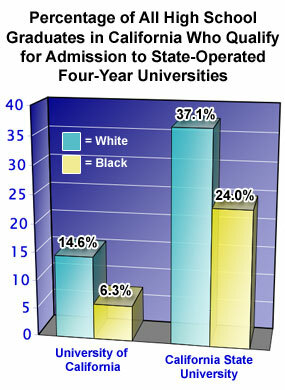 For whites, 14.6 percent of all high school graduates in California met the admission standards. There was some good news in the report. The data showed that since 2003 the percentage of black high school graduates in California who met the admissions standards for the California State University system increased from 18.6 percent to 24 percent. There was only a slight improvement since 2003 in the percentage of black students who met the admissions requirements of the University of California system. A new study to be published by the Russell Sage Foundation shows a positive impact in racial attitudes for college students who are part of a racially diverse student body. The study, whose lead author is James Sidanius, professor of psychology at Harvard University, is entitled The Diversity Challenge: Social Identity and Intergroup Relations on the College Campus. The study examined the experiences of 2,000 students at the University of California at Los Angeles. Students were surveyed on their racial attitudes before entering college and then after spending a year on campus. At UCLA roommates are assigned randomly. Students who were assigned a roommate of a different race or ethnicity showed a significant gain in their attitudes about people of different races compared to students who had a roommate who was from the same racial or ethnic group. This finding of improved racial attitudes was found regardless of racial attitudes expressed by the student as measured by the preliminary questionnaire. The study also found that students who joined groups with an ethnic or racial focus and students who joined fraternities and sororities, which tend to have homogeneous memberships, were less likely than other students to show improved racial attitudes within one year of coming to campus. More than 100 faculty members at the University of Massachusetts at Amherst have signed a petition asking for the reinstatement of former student Jason W. Vassell. The 23-year-old African-American student left the university after being charged with two counts of aggravated assault with a dangerous weapon. Vassell was accused of stabbing two white young adults in the lobby of a UMass dormitory last February. Vassell claims that the two whites, who were not students at the university, taunted him with racial slurs through his dormitory window. The two white men then gained entry to the dormitory and confronted Vassell. The black student said he was attacked and had his nose broken before he stabbed the two white men with his pocketknife in self-defense. The case is scheduled to go to trial in March. Very few students from the predominantly black Baltimore city school system enroll at the two most selective universities in the state, Johns Hopkins University and the University of Maryland at College Park. This academic year, just 57 of the more than 4,000 freshmen at the University of Maryland are graduates of Baltimore’s public schools. The university offers nine full scholarships including tuition and room and board to Baltimore high school graduates. Johns Hopkins University sends recruiters to all Baltimore high schools. Through its Baltimore Scholars program, Johns Hopkins offers free tuition to any graduate of the Baltimore public schools who wins admission to the university. In 2005, 23 Baltimore high school students gained admission to Johns Hopkins. The year before, when the program was not in effect, only five students from Baltimore high schools enrolled at Johns Hopkins. This year there are only 13 freshmen at Johns Hopkins from Baltimore high schools. Baltimore public schools are 89 percent black. For many of these students, attending a predominantly white university is a cultural shock that few of them are willing to face. Instead, many of these black students choose to enroll at one of the four historically black universities in the state, two of which are located in Baltimore. But the largest barrier is the fact that students in Baltimore city high schools are almost never qualified for admission to selective colleges and universities. Many of the high schools in Baltimore do not offer Advanced Placement courses that are a staple of students who gain admission to selective universities. Only 4 percent of the students who enter Baltimore public high schools in ninth grade go on to earn a college degree over the next decade. • Tavis Smiley, the radio and television show host, author, and philanthropist. Duke University’s Franklin Humanities Institute announces a fellowship program for faculty in the humanities at Historically Black Colleges and Universities. The program is made possible by a grant from the A.W. Mellon Foundation. Fellowships support a year of research with opportunities for interaction and collaboration with the scholarly community at Duke and neighboring UNC-Chapel Hill, NC Central University, NC State University, and the National Humanities Center. Two fellowships will be offered in 2009-10. Fellows will be provided with a stipend, access to health insurance, an office, library access, and research/travel funds. Stipends for Asst. & Assoc. Professors are $40,000; full Professors receive $60,000. For complete program and application information, visit www.fhi.duke.edu. Prospective applicants are encouraged to contact the Franklin Humanities Institute at FHI@duke.edu or (919) 668-1902. Martha Putney, military historian and educator, has died in Washington from chronic obstructive pulmonary disease. She was 92 years old. A native of Norristown, Pennsylvania, Putney won a scholarship to Howard University where she earned a bachelor’s degree in 1939 and a master’s degree in history a year later. Unable to find a teaching position, Putney joined the Women’s Army Corps in 1943. After World War II she used the GI Bill to earn a Ph.D. in European history from the University of Pennsylvania. She then began a long teaching career, first at Bowie State University and later at Howard University. At Bowie State, she was chair of the history and geography department. Putney was a well-regarded historian. Her books Black Sailors: Afro-American Merchant Seamen and Whalemen Prior to the Civil War (1987), When the Nation Was in Need: Blacks in the Women’s Army Corps During World War II (1992), and Blacks in the United States Army: Portraits Through History (2003) are all highly acclaimed. A story on the life of Dr. Putney appeared in Tom Brokaw’s bestseller, The Greatest Generation. Enyi Okereke, chief of foot and ankle surgery at the University of Pennsylvania Medical Center and associate professor at the University of Pennsylvania School of Medicine, died from a heart attack while training physicians in his native Nigeria. He was 54 years old. Dr. Okereke came to the United States as a teenager. He earned a bachelor’s degree at the University of Buffalo. He went on to earn a master’s degree and a Ph.D. in pharmacy at Mercer University. He was a graduate of the Howard University medical school. Claiborne Pell, a six-term U.S. senator from Rhode Island, died from Parkinson’s disease on New Year’s Day at his home in Newport. He was 90 years old. Senator Pell was the author of the 1972 legislation creating Basic Educational Opportunity Grants which were designed to meet tuition costs for low-income students at state-operated colleges and universities. In 1980 the Pell Grant program was renamed in the senator’s honor. Over the past 35 years millions of young African Americans, who otherwise would not have been able to afford college, have enrolled in higher education with the benefit of Pell Grants. • Fisk University, the historically black educational institution in Nashville, Tennessee, received a $1,430,000 grant from the Kresge Foundation. The grant money will be used to shore up the university’s financial foundation. • North Carolina A&T State University, the historically black educational institution in Greensboro, received a three-year, $200,000 grant from the U.S. Department of Energy. The funds will finance a research project to develop a process for the steam reforming of methanol with more stable catalysts and less production of carbon monoxide.